After US Government authorities rescinded Executive Order 9066 in 1944, the 127,000 Japanese Americans imprisoned during World War II struggled to salvage remnants of their former lives outside of relocation centers. Despite the economic integration during postwar periods, the Japanese American generations found differentiating perspectives in their lives after incarceration. 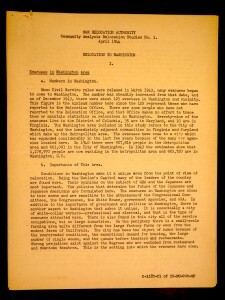 The primary document of the WRA Relocation to Washington reflected upon the dissimilar adjustments the Issei and Nisei population faced after moving out of relocation centers. I argue that the WRA report contain biases towards the success of Isseis and Niseis who adapted into different fields because the US Government wanted to establish itself as a Leader of Democracy. 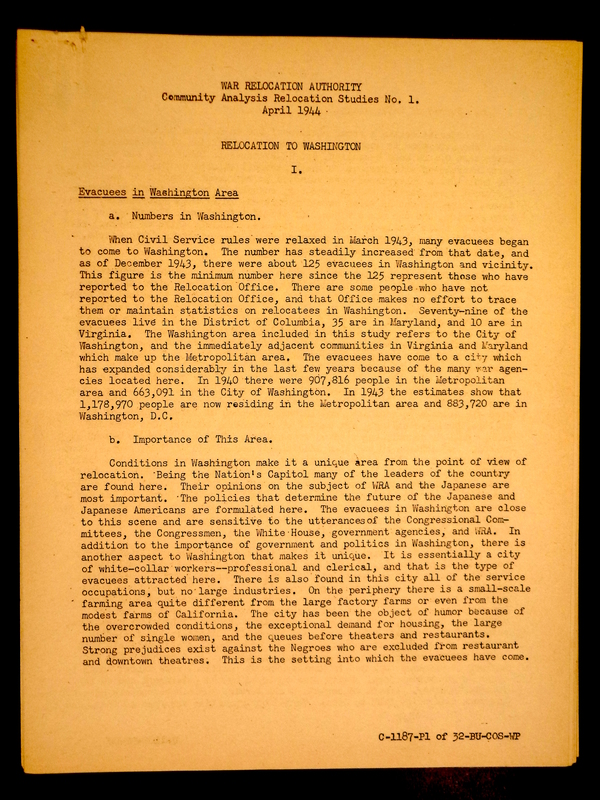 Despite the historical context of the primary document, there were intentional biases on the Issei and Nisei perspectives portrayed by the WRA. Primarily, the documents were approved by the authorities, which could contain facts worked to the advantages of the US Government. 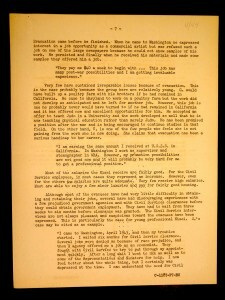 For one, the report’s sources were based on interviews of 22 carefully selected individuals “…in order to obtain [a] broad picture of the adjustment of the Issei and Nisei…” However, the interview quotes were bias and mainly focused on the US Government’s role in helping the Japanese Americans relocate to a better living environment post-WWII. As well, the Relocation Authorities announced “…jobs have not been a serious problem for the evacuees. In most cases, they obtained jobs shortly after their arrival…” with the help of the Relocation Office. 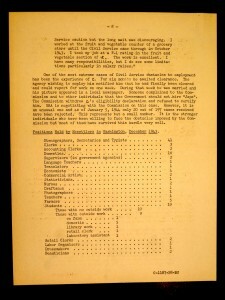 Despite the fact that a large number of evacuees found only temporary placements, the report stressed interview quotes that supported the importance of the WRA in helping resettling groups obtain employment. This demonstrated how the Government intentionally showed only the success of Japanese Americans since the US wanted to establish itself as a “Leader of Democracy”, fighting its past image of racial inequity. As such, Cold War Orientalism that celebrated America as a racially, religiously, and culturally diverse nation could have played a distinctive role in the need of a bias perspective in these WRA documents to justify their actions during the war. 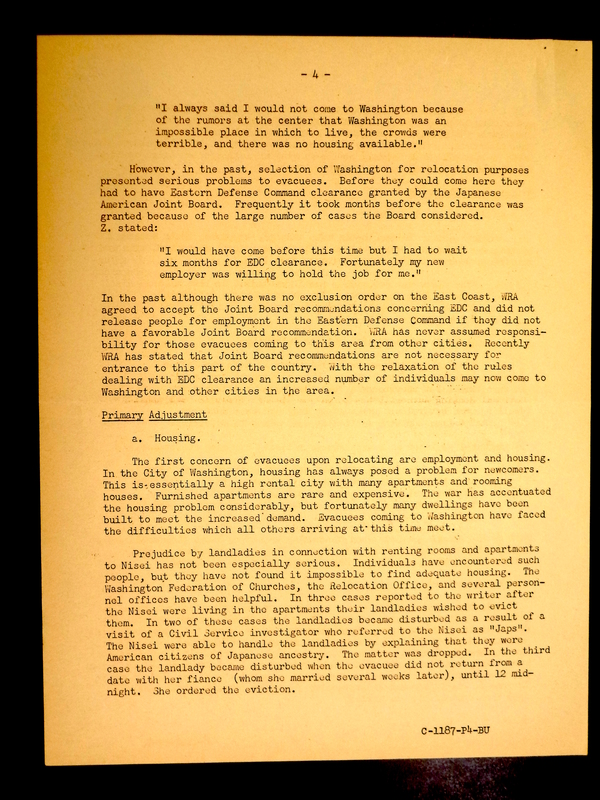 Furthermore, the primary document takes a bias perspective of the Japanese American identity after WWII. With the end of incarceration, the Issei and Nisei population were skeptical and cautious of any social or political perspectives that may cause detrimental results during this difficult time. 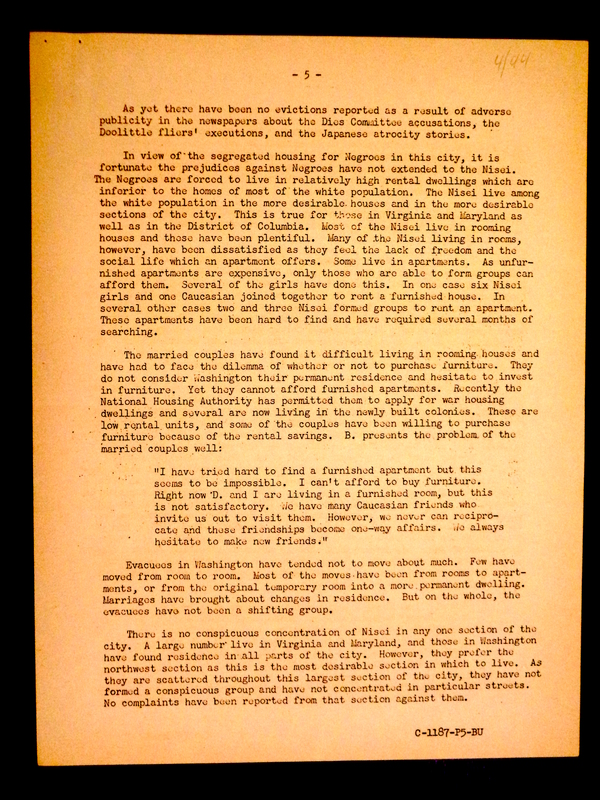 The reported cases of landladies in Washington who evicted Japanese Americans due to race prejudice were early signs of White antagonism even post-WWII. 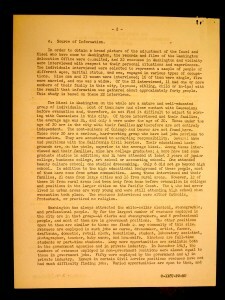 Niseis were especially cautious, such as B. who expressed that he does not like any affiliations and “…I prefer to remain out of all controversies.” Overall, the bias of the primary document were worked in favor of the US Government, who wanted to establish itself as a Leader of Democracy, helping the Japanese Americans to become successful post-WWII. 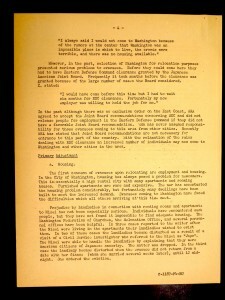 Notwithstanding the detrimental effects incarceration had on the Issei generation, the WRA highlighted that this act had little negative impact. 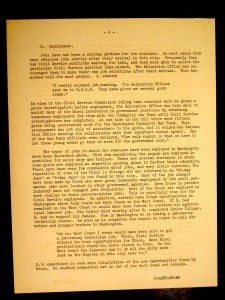 The document emphasized its efforts on the First Leave Programs to help Isseis find work in the agricultural industry that had depleted the workforce during the war. Some 10,000 Japanese Americans were hired to work for the Sugar Beet companies in the Rocky Mountains and the Portland Assembly Center. However, most Isseis returned to their old neighborhoods, held similar positions prior to their incarceration as housekeepers, farmers, or unskilled laborers, and revived similar social organizations. 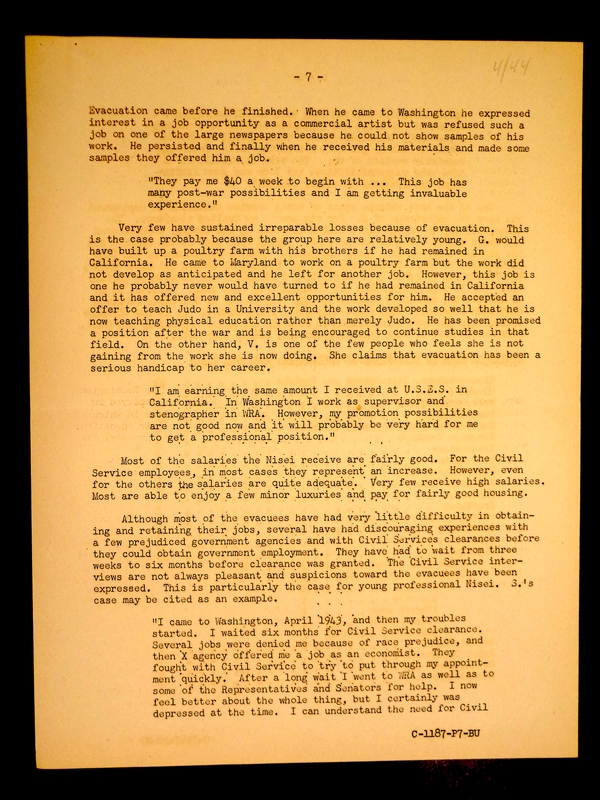 The WRA attempted to portray this resettlement as an easy process as “most of the evacuees have had very little difficulty seeking and retaining their jobs…” However, this perspective was not reflective of the West Coast’s strong anti-Japanese sentiment post-WWII. Remember the Pearl Harbor League (RPHL) and the Japanese Exclusion League (JEL) were two prominent groups that protested the resettlement of the Issei population through organized labor threats, political flyers, and word of mouth. 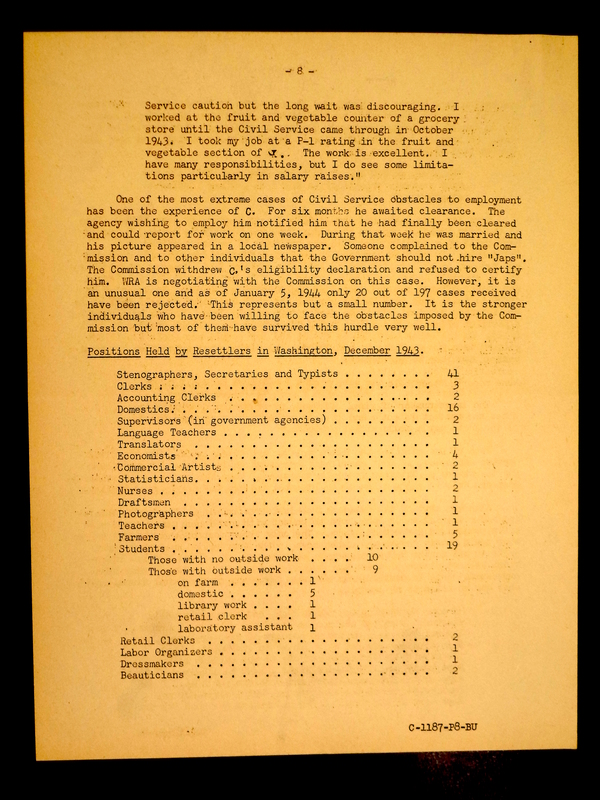 As well, the primary document failed to mention the cases of shots being fired at Japanese American labor camps. The Issei population mostly believed that this occurrence could not be helped or “shikata ga nai” as signs such as “No Jap Trade Wanted” clearly stated that many resettlement locations did not welcome its former Japanese American residents. Despite the WRA’s attempt to highlight incarceration as an act that had little negative effects, it heavily impacted the Issei in social, economical, and political perspectives. Overall, the Issei generation, the majority of whom resettled to their neighborhoods prior WWII suffered from the anti-Japanese sentiment as a result of the war. On the other hand, the US Government crafted the perspective that incarceration in fact, helped the Nisei in their upward class mobility through their efforts as the Model Minority. The WRA contrasted the Nisei as an exemplary Model Minority group, who represented hard work and good citizenship, to the African Americans who were lazy and always asked for more. 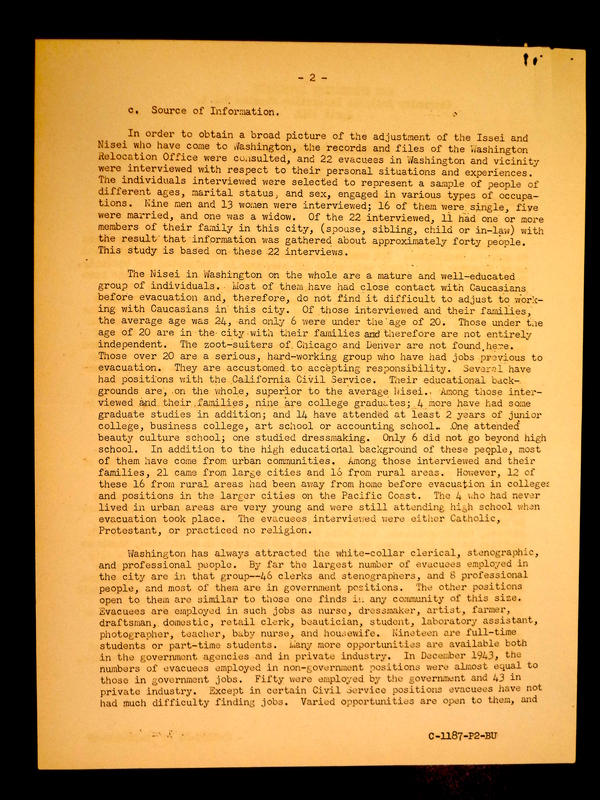 The report specifically mentioned, “…it is fortunate the prejudices against Negroes have not extended to the Nisei.” In addition, the Nisei generation was able to obtain higher education under the direction of the American Friends Service Committee, National Japanese American Student Relocation Council, and other religious groups, which the Blacks did not have access to. Over 4,084 Niseis went on to college and other places of higher education between 1924-46, which allowed them to gain more opportunities and contributed to their upward class mobility. As portrayed by E., son of an agricultural laborer reflects, “I never would have been able to a laborer technician job…the Japanese had to do all the dirty work…” after his completion of higher education at Junior College. 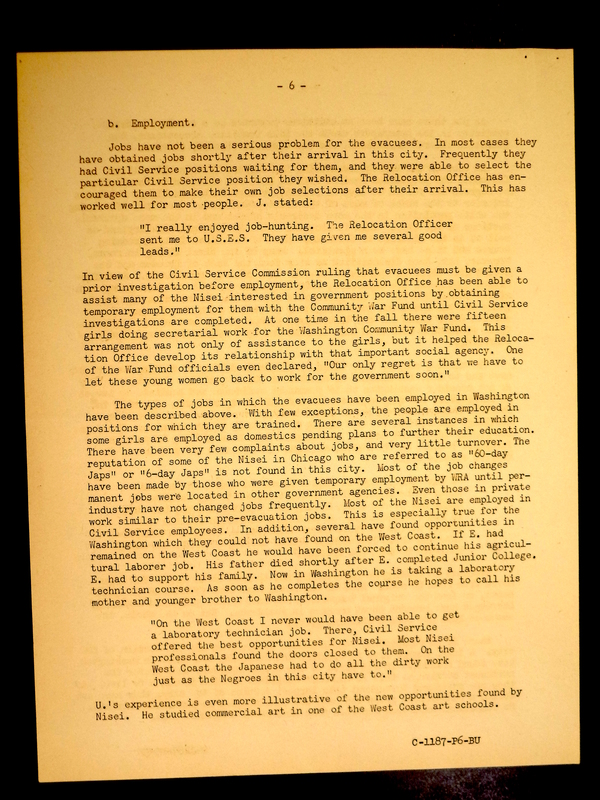 In addition, the more linguistically and culturally fluent Nisei was able to move to the East Coast and Midwest states where they were able to seek employment opportunities as public servants, secretaries, lab technicians, and other skilled labor with adequate pay and minor luxuries to enjoy. The government authorities also implemented resettlement policies to encourage the organization of ethnic communities to help restructure better educational and employment opportunities. Despite the fact that Niseis experienced a strong upward shift in class mobility and eventually settled in urban centers, there were still discriminatory hurdles in employment, housing, and social areas. 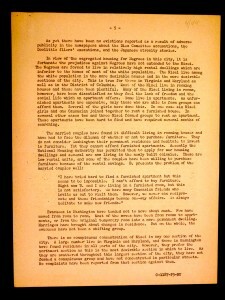 Contrastingly, the WRA reports revealed that the emerging African American population often “bore the brunt of overt racial animosity…” due to the Model Minority concept, which suggested that the Niseis became more successful with the multitude of opportunities available due to their efforts going through incarceration. As such, the Nisei population experienced an upward shift in their social class through their opportunities to attend places of higher education, substantiated government policies, and their success as the Model Minority. However, incarceration in relocation centers brought negative social, political, and economical effects on the Nisei generation, unlike the WRA’s bias perspectives that it contributed to the generation’s success. In conclusion, the WRA report contains biases to establish the US as a Leader of Democracy by emphasizing the success of Isseis and Niseis post-WWII. Despite the fact that incarceration negatively impacted the Isseis, the US Government attempted to fight its past images of racial inequity by emphasizing the success of the Isseis when they returned to their jobs. As well, the report also argued that incarceration helped the Nisei establish itself as the Model Minority, which allowed the generation to gain more opportunities to success and upward mobility. However, this was a bias perspective from the US Government as both generations suffered from social, political, and economical hurdles due to incarceration. WRA US Government Primary Documents, “War Relocation Authority Community Analysis Relocation Studies No. 1 Pg. 2” US Government, Dec 1, 2014. 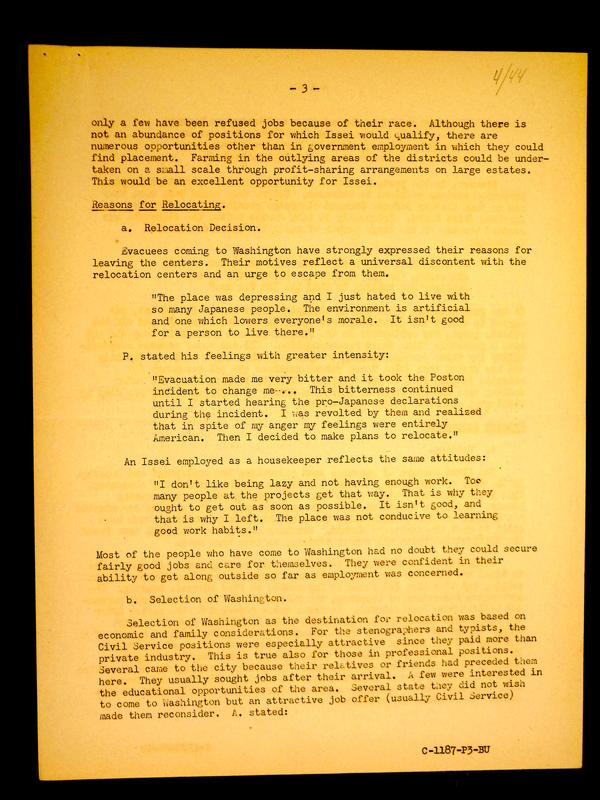 WRA US Government Primary Documents, “War Relocation Authority Community Analysis Relocation Studies No.1 Pg. 6” US Government, Dec 1, 2014. WRA US Government Primary Documents, “War Relocation Authority Community Analysis Recloation Studies No. 1 Pg. 10” US Government, Dec 1, 2014. WRA US Government Primary Documents, “War Relocation Authority Community Analysis Relocation Studies No. 1 Pg. 7” US Government, Dec 1, 2014. 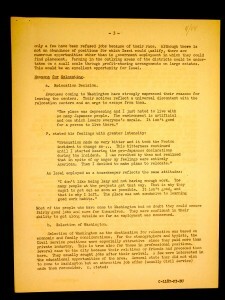 WRA US Government Primary Documents, “War Relocation Authority Community Analysis Recloation Studies No. 1 Pg. 5” US Government, Dec 1, 2014. WRA US Government Primary Documents, “War Relocation Authority Community Analysis Relocation Studies No. 1 Pg. 6” US Government, Dec 1, 2014. Charlotte Brooks, “In the Twilight Zone between Black and White: Japanese American Resettlement and Community in Chicago, 1942-1945,” Journal of American History 86.4 (2000), 1675.